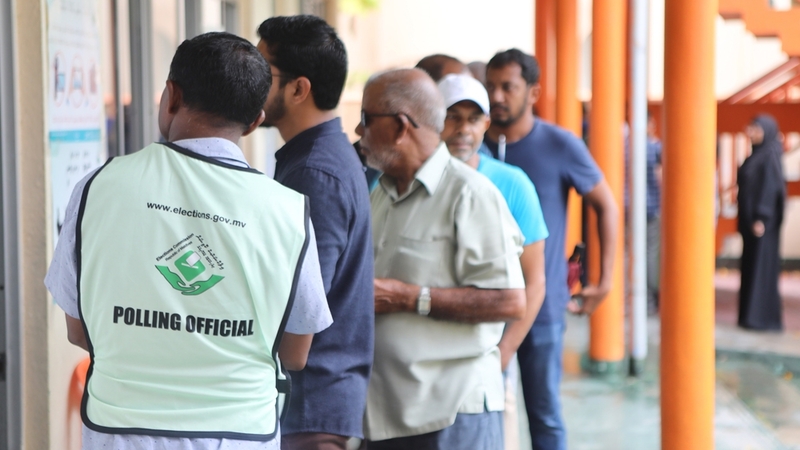 Male, Maldives – Polling stations have opened in the Maldives for a tense presidential election regarded as a test for democracy in the popular Indian Ocean honeymoon destination. 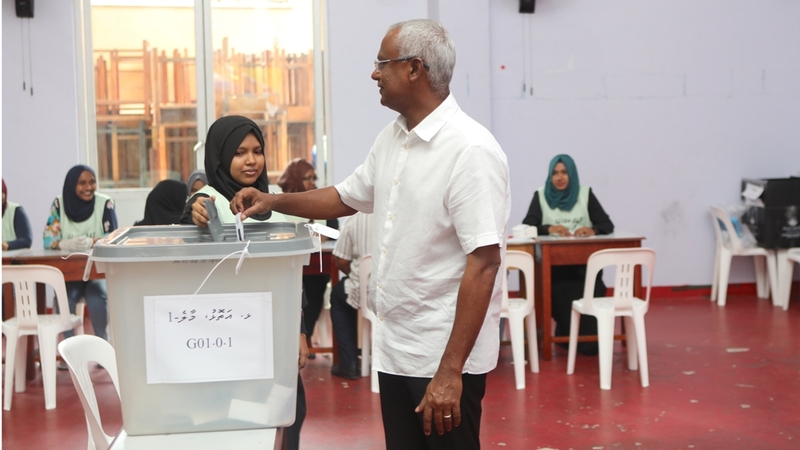 Sunday’s vote pits President Abdulla Yameen, who has presided over a wide-ranging crackdown on dissent, against opposition figure and long-time member of parliament, Ibrahim Mohamed Solih. Hundreds of voters had queued up overnight on islands across the country to cast their ballots before polling stations opened at 8am (3:00 GMT). More than a quarter of a million people, out of a population of nearly 350,000, are eligible to vote in the island nation, which has been in turmoil since its first democratically elected leader, Mohamed Nasheed, was forced out of office in 2012. Azka Adil, a 20-year-old athlete who is voting for the first time in the Maldives’ capital, Male, said she was “excited, nervous and scared because the vote might be rigged”. “But I am definitely voting,” she said. Ahmed Ibrahim, a 28-year-old government employee who is voting for Yameen, said he was choosing “strong economic policies”. Yameen, who assumed power in 2013 after a disputed election, has jailed or forced into exile nearly all of his political rivals, banned protests, suspended parliament, and declared two states of emergencies in just five years. Faced with widespread international criticism, he pulled the Maldives out of the Commonwealth in 2016 and fostered closer ties with China and Saudi Arabia, who have funded the country’s infrastructure boom. Defending the Maldives’ Islamic faith and sovereignty and boosting the country’s economy were cornerstones of Yameen’s election campaign. At a final rally in Male, Yameen said the choice on Sunday was between Islam and “infidelity”. “I am serving the nation. I want to save the Maldives,” he told thousands of cheering supporters in Male. Solih, the opposition candidate, has vowed to restore democracy and release dissidents, who include Yameen’s half-brother, Maumoon Abdul Gayoom. The vote was “the last chance” for democracy, he told a crowd of yellow-clad supporters. The government has denied entry to foreign election monitors and journalists. Mariyam Shiuna, executive director of Transparency Maldives, an election-monitoring group, said “the atmosphere is tense and uncertain” in the country especially after a police raid on the opposition’s headquarters on the eve of the election. Officers claim they were looking for evidence of vote-buying, a move the opposition said was aimed at disrupting the election. Despite the fear, Shiuna said the huge turnout at rival rallies in Male on the final day of campaigning showed “people are keen to cast their ballots and have their say”. “Yet, there is an eeriness to this election because anything is possible and the general feeling is that neither party will accept the results if they lose, which will lead to further chaos,” she said, urging the international community to monitor events in the Maldives closely. Ahmed Shareef, president of the elections commission, assured reporters in Male of a fair vote on Saturday. More than 2,000 local monitors are expected to observe the election, while the European Union said it did not send observers because the country failed to meet basic conditions for monitoring. The US has threatened to take action against officials if the vote is not free and fair, and the EU said it was prepared to impose sanctions, including travel bans and freezing assets, if the situation does not improve.